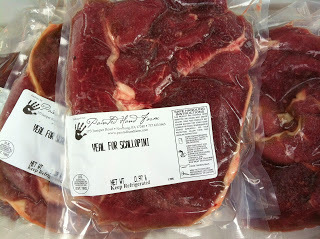 Harvesting, processing and packaging your product is different than what is typically done for other meat you harvest. With this article, Sandra points out the challenges and then how to be successful. I want to make this clear from the start–I DO NOT kill, slaughter, butcher or murder my calves…they are harvested. Just like other farmers, I’m raising a crop destined to provide sustenance for human consumers. Routinely, I am faced with someone staring at me with their sad, puppy-dog eyes and whining, “But how can you kill your babies?” And while to date I’ve avoided the urge to reach out, grab them by the throat and punch them in the face, I have instead, over time, developed a response that has led to the highlight of my veal venture: I sold scallopine to a pair of militant, vegetarian, animal-rights activists who had arrived complete with placards of ugly, industrial veal barns to picket my stand at an outdoor farmers market in Washington, DC. First, let’s get this straight. 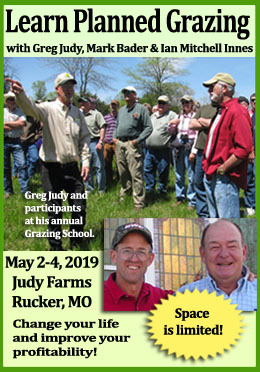 Just about all animals raised for human consumption today–industrial, organic, sustainable, feedlotted, pasture-raised and otherwise–are young animals who have not reached sexual maturity. In other words…babies. Meat chickens are 8 weeks, lambs and goats under a year, 6-7 months for pigs, and beef producers like to keep their animals under 30 months so they do not have to spend the extra money at the processor to remove the spine prior to butchering due to new Mad Cow preventative measures. Very little in the food chain today isn’t a young animal. As discussed in Part Two of this series, dairy breeds are not conducive to putting on enough muscle fast enough to warrant a feasible return as a beef animal. These are the most likely candidates for veal. 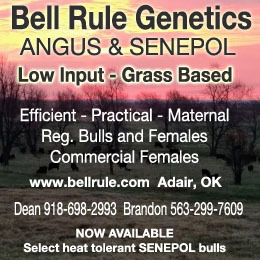 However, there are many smaller family cow-calf beef operations now leaving their cull heifers on the cows until weaning to produce premium veal instead of pulling the calf at birth and shipping for a fraction of what they’ll ultimately reap from a finished product. Invariably, the question gets asked, “How old are your calves when they are harvested?” This is a timely answer because veal can be harvested at number of ages depending on the conditions. Primarily, I choose to harvest by weight. In the colder months, calves do not grow much so they may live a few months more than their counterparts on whole milk, spring flush or browsing with goats. Holsteins are born one third of the way to finished weight for me as I choose not to raise animals much past 300 pounds. 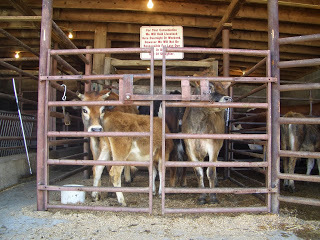 However, there are other farmers/ranchers who will take their veal calves as high as 700 pounds prior to processing. If left on the mother for a full season calves easily reach that weight being only milk and grass-fed. The commercial guys have told me that I’m not raising real veal since I allow my animals to move around, wean them from milk, let them eat grass and let them get so big. 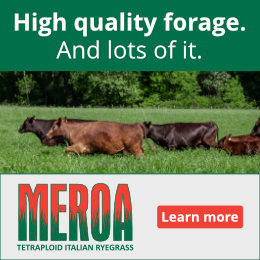 But the truth is veal has traditionally been the young male offspring of the dairy calves, harvested at the end of the grazing season just before farmers had to start feeding stored forage. Some might have been several months old while others were only a few months old. Once, I took a bred heifer just over a year old who was already showing signs of chronic mastitis to the processor for a neighboring farmer along with my own animals saving them the trip for a single animal. When the meat was returned to them it had been graded by the inspector as veal and labeled as such prompting quite a tirade on the subject. And some days, there are those gangly little souls who, no matter how much milk or lush pasture you give them, just never seem to thrive. Speaking from experience, I prefer to harvest them underweight and strictly for sausage which guarantees a solid price. You’ll know who these little guys are. The whole idea is to harvest non-essential animals that have been fed only by the grace of Mother Nature. You get a cash crop with little to no inputs. That means for some farmers, the limiting factor is pasture and forage. When the fields go dormant, the calves get harvested, period. This is where art meets experience. For me, the artistry is in cooking–what’s the best size for a rib chop, loin chop and how does that translate into live weight and body condition? What cuts don’t sell…ever? What sells out first? And there you are, caught like a deer in the headlights out of ignorance. It happened to me….once. I removed every package of loin chops left in my inventory and ate them myself. The customer was right; what sorry little medallions of meat, barely a morsel, there were on the bones. After coming to farming via professional cooking, I was truly embarrassed by what I had sold my customers. 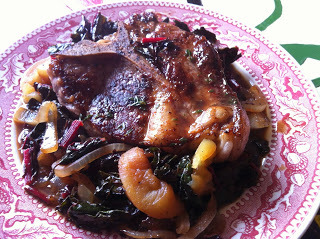 The next time I dropped animals at the processor, I confronted the butcher about the chops. “Hey, I just cut what you tell me to cut,” he replied. “Well, I’m not here when you’re cutting up my animals and from now on, I don’t want you cutting anything that you wouldn’t serve to a guest at your house. Turn it into a roast or grind it and pack the bones,” I requested. “Yes, ma’am,” and with that I never received another complaint from a customer about the quality of a cut. To further increase my knowledge about my products, one winter I took three calves of varying sizes, breeds and weights to a custom butcher for private sale. He agreed to allow me to work with him while he processed the carcasses from the kill floor to the packaging. From this experience, I learned things I would have never considered such as informing the processor before the animal is harvested that you want to have the tongue and sweetbreads (thymus gland that runs along the esophagus and trachea and the pancreas). Don’t just list them as a request on the cuts sheet as that sheet is often only read when the carcass is ready to cut. By then, these items are long gone because they are not routinely cut by small-scale processors. Withholding feed for twelve hours prior to processing makes a huge difference in the cleanliness of the whole deal. A full rumen is a most frightful and nasty thing to contend with during processing. That’s one of the reasons most processors ask for animals to be delivered to their holding facility the night prior. Scallopine is best when cut with the fiber direction by hand from a single muscle instead of the whole boneless rear thigh cut on a slicing machine when partially frozen. Here’s the difference in the kitchen–one gets the crap pounded out of it with a hammer before it’s tender enough to cut with the fork, the other doesn’t. In addition, Scallopine should be packaged in flat sheets, not all rolled up into a ball. Livestock (not just calves) that don’t have proper access to minerals are much tougher to bleed out and skin. You have a sub-clinical issue with pneumonia. Your livestock has a heavy parasite load and what kind–Barber Pole worms in the stomach, liver flukes, lung worms, lice and ringworm. This is important information for you, so don’t just blindly drop off your animals at the processor, pick them up and pay your bill without a quick conversation about anything notable. Ultimately, developing a relationship with your processor will help you to deliver a first-class product pleasing everyone involved in the process from the pasture to the plate. Recently, I spoke to a dairy farmers in New York who is just beginning to market their veal. 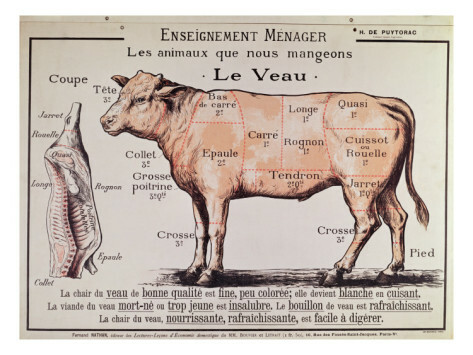 “One of the challenges we’re having is getting our customers to understand the cut sheet because it’s not like a beef,” was their comment that got me thinking about my experiences with raising, harvesting and selling veal retail. If there is one piece of advice taken from this installment, I want it to be that YOU, as the producer, makes the final judgement call on when and how to process your animals…not the customer. They should only be given that right when they are standing next to a live animal and have run their hands over its flesh to verify that is the size they want. Over the years, I have had many goat customers who have chosen their own animals, but never for veal. This is one product where customers are quite happy to trust the producer’s judgement. Here is a list of my cuts for premium calf cuts I have sold over the years and their popularity. Yes, you’ll notice the head and the bones on that list. These two items are extremely coveted by chefs and foodies. Recently, a senior editor at Bon Apetit listed her favorite meal of the year as being ravioli stuffed with calf brain and within a week of the magazine’s publication I had at least a dozen requests for my heads. Note: In order for the head to be returned to the customer, for either USDA or custom, the animal must not be dispatched with a bullet or captive bolt. Another good question for your processor. And bones! Don’t forget to package and label the bones. Unless you have a standing order from a chef, ask for 3-5 pound bags as that is what most home cooks can handle at a time. If they want more, they’ll buy more. 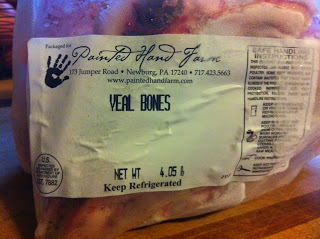 Good veal bones make the most incredible, silky, gelatinous stock. But what about those less-than-premium calves? While it’s easy to turn an entire animal into burgers and sausages, there’s no need to grind certain cuts that are perfectly fine and would command a better price per pound than burgers or sausages–mainly the Osso Buco and boneless loin. Similarly, be certain to have all the bones packaged and labeled for sale. In the list above, you’ll notice a few “value-added” items. Some of you may not have heard this term before. It’s part of the lexicon meaning to change from it’s raw form to create another product with increased value. For me, sausage and patties top the list. Fair warning though, these items require an added expense to produce and this must be reflected in the final products’ pricing. For instance, my processor charges $0.10 for each patty made and as much as a dollar per pound for sausage depending on the flavor and type of casing. While going to farmers markets or selling retail via buyers clubs is not for everyone, with the right marketing veal can also be sold whole, by the side or in primal cuts. It is best to simply wrap these in sheets of food-grade plastic and deliver fresh. While growing up, I remember my family splitting a side of beef with their friends and everyone getting together wrapping meat in waxed paper and taping shut with freezer tape. In this day and age, there should be no reason that a processor would ever wrap meat in paper destined to be frozen and sold for retail. But just because a processor owns a commercial vacuum sealer doesn’t mean they know how to use one properly. 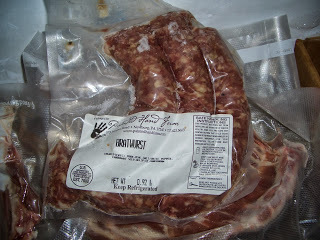 Vacuum-sealed product can last up to two years in a deep freeze without any ill effects to the meat. 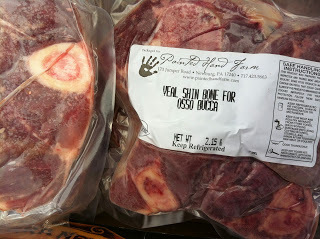 Bone-in cuts are particularly difficult to seal. If you notice that your packages of chops tend to not maintain their vacuum, ask that they be bagged in another plastic bag prior to the final seal. Some processors will even use small patches of mesh to cover parts of bones for a better seal. Before having a large run of patties done out the ground, ask if they are frozen in patty form before sealing. If not, ask this to be done or don’t make patties. Nothing is more visually unappealing than patties squished beyond belief when sealed. Some processors also do this for sausage links as well. In the end, it’s not just producing a healthy, harvestable animal that is key to raising veal for sale, but to present that animal after harvest in a way that is pleasing to be cooked and eaten. Learning when to harvest calves. Stay tuned for the final installment of this series when we’ll wrap up with sales & marketing. I’ll also be sharing a separate article for everyone producing meat on how to find a good processor. If you’ve missed any of the series, the previous installments can be found here: Veal Part 1, Veal Part 2, Veal Part 3. Sandra Kay Miller is a female farmer, damn good cook and witty writer slicing her finger open on the cutting edge of sustainable agriculture. Visiting her Painted Hand Farm is like living a crash course on all that's right with food and farming today - taught by one of the most delightful people ever to rebuild an antique Babson Surge Milker (and use it!) or raise a goat from birth to curry pot. Sandra has served on the boards of many organizations and has been instrumental in developing farmers markets. She's a prolific writer and speaker sharing her knowledge and experience with others.